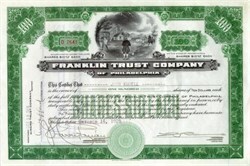 Beautifully engraved uncancelled crisp certificate from the Franklin Trust Company issued on October 14, 1929. 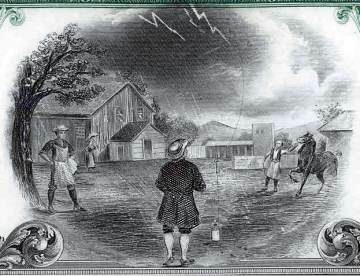 This historic document was printed by the Security Banknote Company and has an ornate border around it with a unique vignette of Ben Franklin with kite & key discovering electricity, lightening and farm scene. The certificate is in crisp condition. This item is hand signed by the company�s treasurer and assistant treasurer and is over 77 years old. This item was issued two weeks before the stock market crash signaling the beginning of the depression.